Windows are fantastic to work with and are great for artistic purposes. 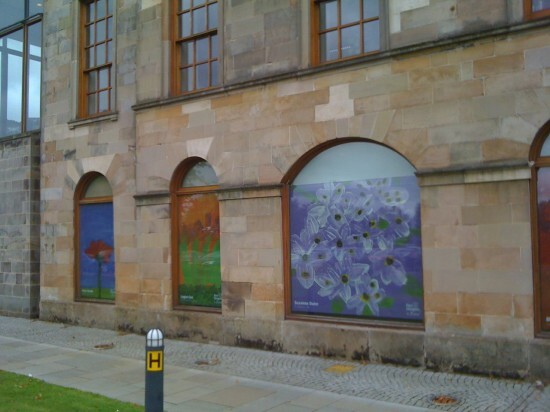 Every council, library or business will have some form of window that we can work with to create something memorable. We have many techniques for completing our projects from solid vinyl, contra vision and also a great new window mesh we have sourced. Windoposta™ allows for full colour graphics to be installed to any window without any skilled installation process. This allows displays to be taken down and replaces as many times as you want without leaving a sticky residue associated with vinyl. The mesh material also allows visibility from inside while giving vibrant colours from the outside which is great for offices, shops and libraries. Please do get in contact for more information 0844 257 6274.